HBO’s documentary series The Jinx: The Life and Deaths of Robert Durst ended last night with an apparent murder confession by the show’s eponymous septuagenarian protagonist. Durst was the heir to a huge fortune, but was suspected of killing at least three women, including his wife. At one point he was “living in a $300-a-month rooming house in Galveston, Texas, disguised as a mute woman,” according to the film’s director, Andrew Jarecki. On Saturday afternoon, FBI agents arrested Durst in New Orleans in connection with the year-2000 murder of a woman whom police were about to question about the 1982 disappearance of Durst’s wife. It’s a sordid, bizarre, sad, and horrible tale, and it’s characteristic of much of what passes for entertainment in our time. Make of that what you will. It’s not quite all gloom and doom yet, however (though as Bob Dylan noted, “it’s getting there”). 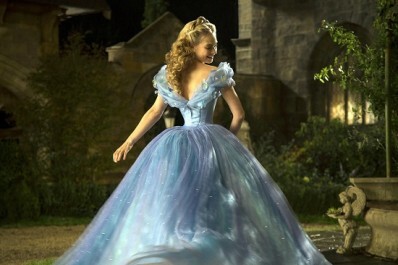 Disney’s Cinderella had a great start at the U.S. box office over the weekend, bringing in an estimated $70 million, the sixth-highest March opening of all time. The latest Liam Neeson actioner, Run All Night was run over by the Disney fairy tale, bringing in just $11 million in its opening week. In third place was the florid adventure-thriller Kingsman: The Secret Service, drawing $6.2 million. But of course people always seem to find something to complain about, and in the case of Cinderella, it’s actress Lily James’s waist. James, who plays Cinderella and made a strong, positive impression as Lady Rose in Downton Abbey, has had to defend herself from accusations that her small waist . . . well, I’m not quite sure what the complaint is. I think, however, that it boils down to the fact that her waist makes some women feel bad about their own bodies. The controversy over James’ body is the dark side of the so-called body acceptance movement, which often is not about body acceptance, but about criticizing the idealized skinny body. There is nothing helpful, healthy or feminist about shaming a woman for being skinny any more than there is about shaming a woman for being fat. And it’s unfortunate that so much attention is being paid to James’ body instead of celebrating the way her character in the film is not a victim saved by a prince, but a courageous young woman who refuses to let her circumstances define her. So the star of a feminist version of Cinderella is being criticized for setting back the cause by being too attractive. Revolutions always end up eating their own, and they never take long to get to that point. It’s enough to drive one to drink, and what better day for it than March 17th? If you’re wondering what to drink for St. Patrick’s Day, the Hollywood Reporter has several interesting suggestions, some of them rather pricey. They also sneaked some cheese into their drinks list, for those who also like to eat on occasion. Those are excellent points, Robert. I agree that the documentary swims against the tide, as you put it, although the fact that the murderer is wealthy is surely a factor in making it acceptable to the HBO audience. So far the score in U.S. documentaries, from my observation, is this: all rich people are guilty, all poor people are innocent. Perhaps they are correct, but one suspects that there is some selection bias going on here. I’m going to take a slightly different angle on “The Jinx.” I watched the first four episodes. Despite the sensational nature of the production, I was impressed by how effectively the filmmakers pinned down a suspect who had wriggled free of the justice system for years. They unearthed incriminating evidence and connected the dots that police in three states had missed. It’s quite clear that the series led to the recent arrent. Contrast that with NPR’s much ballyhooed “Serial,” which churned on an old case but ultimately achieved nothing other than entertainment at the expense of the people involved. I also find it interesting that Andrew Jarecki, director of “The Jinx,” swam against the documentarian tide. Most filmmakers in this genre try to get people off of death row. Here’s one who’s effectively trying to put someone there. Very real questions need to be addressed concerning the timing of the arrest and the possible withholding of evidence. But on balance, I side with the families of the victims in in my appreciation that “The Jinx” was made and broadcast.